Italian yard Benetti has sold BF108, the eighth hull in its Fast 125 series of 38.1 metre tri-deck motor yachts with the buyer introduced by SuperYachtsMonaco. Exterior styling comes courtesy of Stefano Righini, while the interior will be finished in eucalyptus and bay, based on the Air configuration developed by British studio RWD. This design combination was also seen on hull number three in the series, Skyler (pictured below) and delivery is scheduled for 2019. Accommodation for up to 11 guests is split between five cabins, including an owner’s suite, three double cabins and a twin with a Pullman berth. Meanwhile, the crew quarters are suitable for a staff of up to seven people. Key features on board include a side-loading tender garage, leaving enough room for a fully-fledged superyacht beach club back aft, complete with its own bar area. Further al fresco relaxation is offered on the foredeck, where guests will find a hydromassage spa pool, sofas and sun loungers. The propulsion system is one of the Benetti Fast 125’s main selling points. Developed in collaboration with Rolls-Royce, the Azipull C65 features steerable carbon thrusters and takes up less space in the engine room than a traditional shaft-drive unit. Power comes from a pair of 2,636hp MTU 12V2000 M96L engines for a top speed of 24 knots and a cruising range of 1,750 nautical miles at 12 knots. 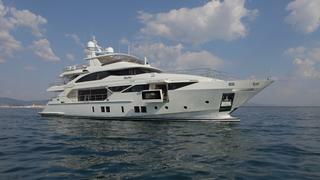 The asking price of the Benetti BF108 has been withheld.